In the wee hours of the morning I had such a radiantly beautiful dream. I woke up at 4 AM and wrote it down. It was so intense, more like a celestial excursion than a dream. 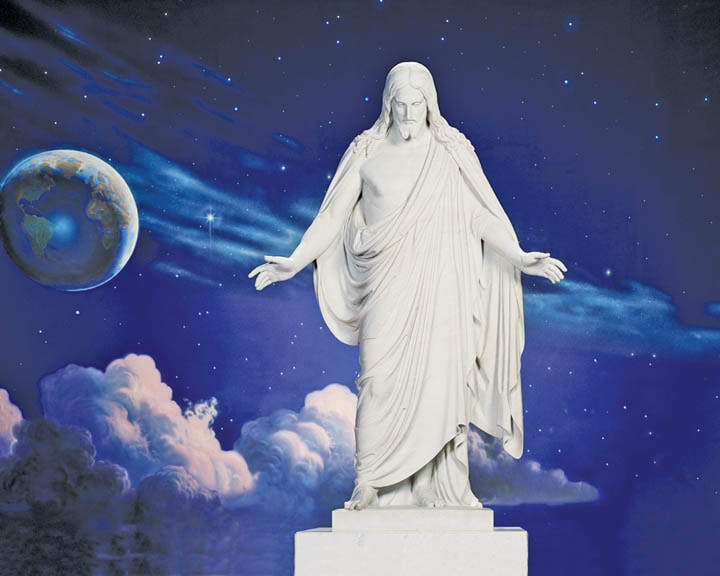 statue of the Master Jesus. I knelt down under the statue and started chanting Om, Om, Om at the same time staring up at the statue of Lord Jesus. As I gazed up at this extraordinary beautiful image of God. Jesus's eyes suddenly flew open and I noticed the eyes of the other statues were moving and some limbs. I was so surprised I let out a little shriek. My shout disturbed the Bishop of the Cathedral who was seated some rows above where I was chanting. Some attendants came running, to find out where the disturbance was. Undeterred, I kept chanting Om, Om, Om until the whole Cathedral began to shake. Then I looked around and saw my husband David, and other friends filling the Sanctuary. I turned towards David trying to tell him what had just happened. While I was whispering to him an announcement came: We were all invited to the World Theater to take a star ship into the celestial realms and experience the starry heavenly showers. I asked my husband if he wanted to go. He replied, "yes! this is a once in a lifetime opportunity!" In the dream I could see the heavenly firmament with dazzling light showers hovering above us. David and I held hands and walked towards the World Theater ready to board the Starship of God. I started waking up even though I surely did not want to!